Hi reader(s), it’s been a while since I posted. Seeing as we only game in the winter and that game dates are getting more and more difficult to arrange we don’t play as often as we like. 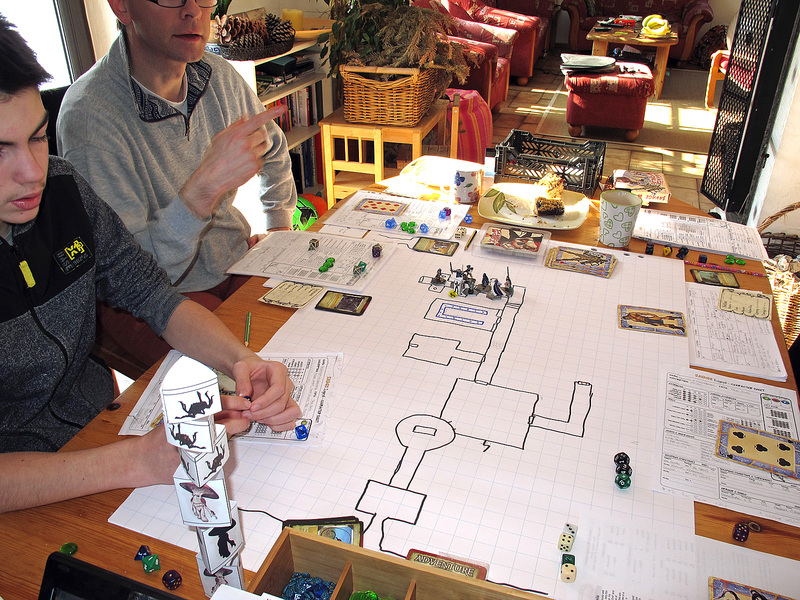 I just wanted to share a couple of photos from yesterday’s session, which saw us completing Steve Foster’s compelling scenario “Freeze Thy Blood Less Coldly“, an epic tale of Old Gods and treacherous trolls – great low fantasy. The Savage World conversion was easy and I’ll be happy to share if anyone is interested. 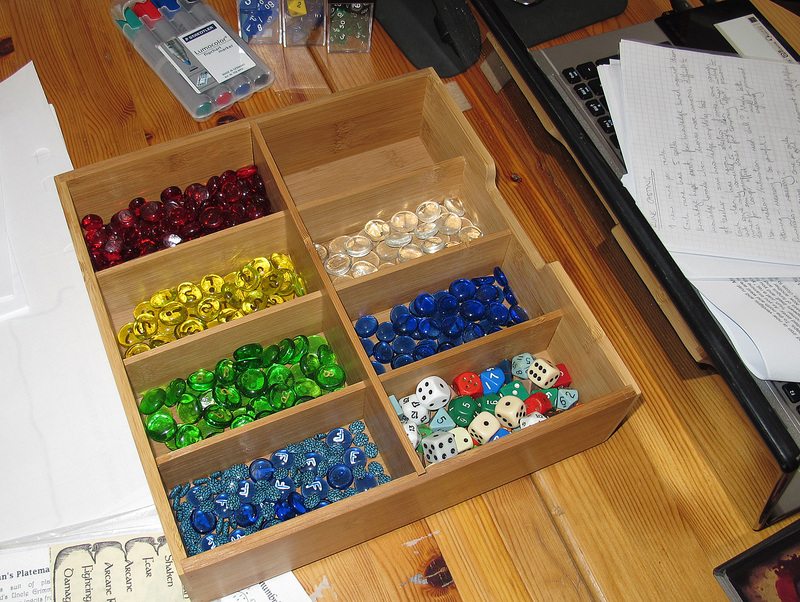 Let’s start with our gaming aids; I picked up a load of 15 mm glass beads cheaply from Amazon a couple of years ago. The red are wound markers, the yellows have been painted with “S”, “T” or “i” to indicate Shaken, Taunted or Intimidated respectively. Moving anti-clockwise we then we have Bennies, Fatigue markers, spare dice and then spare assorted other markers. The clear ones are used for invisibility, for example. Trying to work out the puzzle that will allow them access to Yestor’s tomb. I know that some groups hate puzzles, mine love them and it’s a challenge to keep coming up with new ones. The kids (13 years old at the time of writing) are particularly adept at solving them. The markers in action. Here one of the myconids and a knight are Shaken. The figure flats are home-brew. 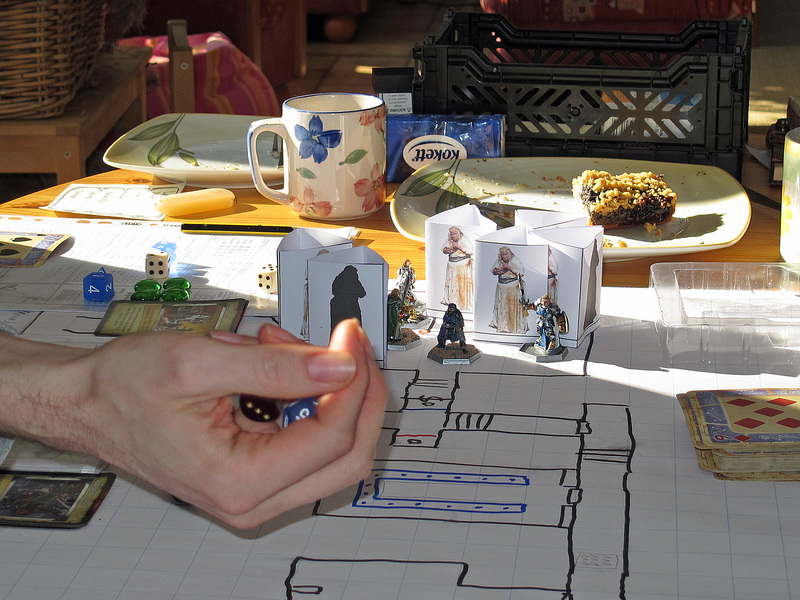 I used to use (well, still do) a load of the Arion Games paper minis as a cheap way of putting figures on the table. Now I’ve created a few empty templates and trawl the interwebs for suitable images. Normally I’ll do two mirror images of a ‘borrowed’ picture for left and right and then a silhouette for the back. Progressing through the tomb, the pile of defeated enemies is mounting. 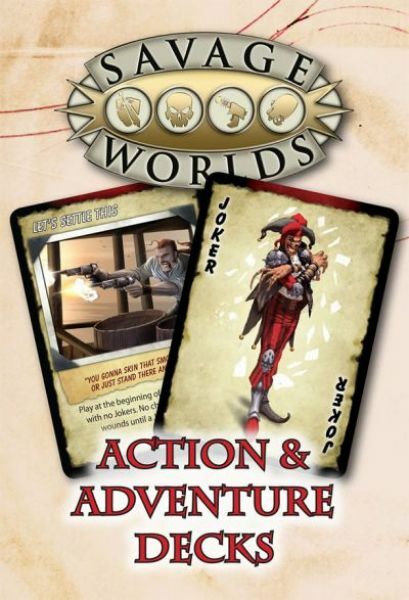 Savage World gamers will recognise a couple of elements here; the Action Deck as well as the Adventure Deck in use. We use custom character sheets, HeroLab for NPCs and each player has a small quick-reference index card showing standard boni. We found that they were forgetting the knight’s Command edge, for example, so they’ve noted on these cards that they all have +1 on Shaken rolls. The troll queen, Aramriogh, has just cast a mirror self spell (I made it up on the spot, I know it’s not in the Savage Worlds canon of Powers). Her second move was to enslave their tank with Puppet, nearly leading to the assassin’s demise a couple of rounds later. They thought that they’d defeated her, but forgot that trolls need to be burned or beheaded, so we had a second round of combat, until Pelesar thought of using Yestor’s mace. 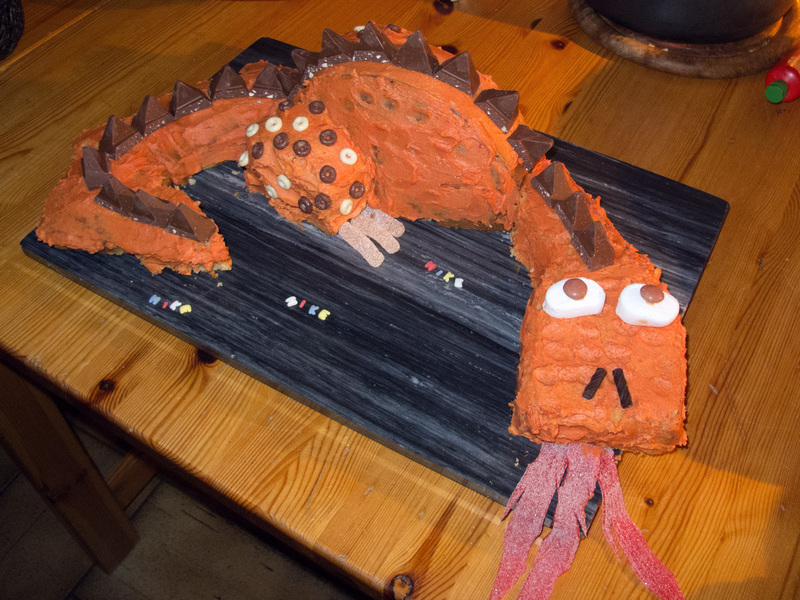 Needless to say, coffee and cake are also integral parts of Savage Legend. I just wanted to share an episode from yesterday’s game involving the adventure deck, something that we started using last year. So there’s a showdown. On an icy bridge. With a frost giant (this is actually taken from a Pathfinder scenario published in Kobold Quarterly and minimally adapted by me to Savage Worlds). My son’s* knight, Sir Elathan, steps gingerly onto the bridge, sword drawn and ready to face down this 15′ monstrosity. They engage. Back and forth the combat goes; first the giant is shaken, then Elathan. I think to myself: ‘this time I’ve got you punk – no more of this cleaving War Trees in a single blow malarky’. The giant starts Defensive and then goes over to Wild Attack when he senses the advantage. Elathan is having to roll agility at the beginning of each action to avoid slipping off the icy bridge and into the raging torrent, whilst my giant’s skin is covered in runes guaranteeing him safe footing on any surface (nothing like stacking the cards in your own favour). “To the first blood”, the giant had said, if the adventurers wanted to cross the bridge. The knight lands another hit, but fails to penetrate the leathery skin. By this time the other players are chanting “El-a-than, El-a-than”. Again. Then my son draws a Joker for initiative and starts bouncing in his seat. Selecting Level Headed and Mighty Blow were two of the best decisions he’s ever made in character progression. “Frenzy!” He challenges me. ‘Bloody hell!’, I think, ‘won’t I ever find something I can throw against him that will put a dent in his shiny armour and even shinier ego?’ Two strikes and the same number of soak rolls later Elathan’s sword is buried to the hilt in the giant’s side, its light-blue lifeblood spilling everywhere. The giant staggers through the door behind him: “My brothers, I have failed!”, he exclaims and collapses. But my son’s not finished yet. Grinning, he slaps a card from the adventure deck on the table: Relic. An item associated with your victory gains magical powers. Yada, yada. The sword now confers Elemental Resistance: Cold upon the wielder. The giant’s blood has imbued the sword with this new power. Insult to injury. But they still needed passage through the giants’ hall in order to reach the high mountain valley beyond. Elathan’s sister, Elowyn, stands boldly on the threshold and demands the right of passage through the hall, facing down three more frost giants that were planned to bloody their noses and teach them some respect for once and for all. Rolls high on Persuasion. “Bah, only those who survive the Rite of the Frost-Flame are permitted to the valley beyond, by decree of the gods!”, is my spontaneous response. My son grins. I know when I’m beat. Time to get back to the drawing board and plan some seriously challenging encounters. The session ended early, but will be remembered for a long time to come. 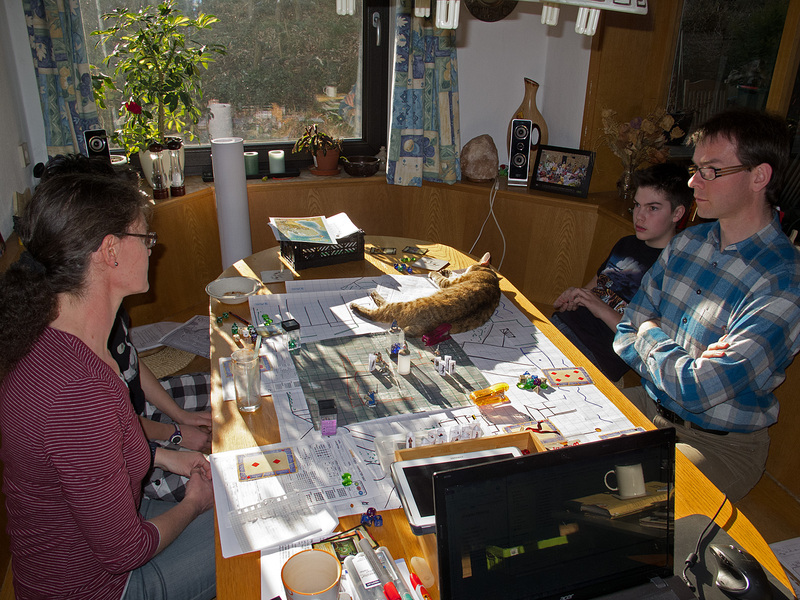 *Our gaming group consists of my 13-year old kids, one of my son’s friends, my wife and a close neighbour from the village. We generally only play in the winter half of the year. Because our group only games alternate weekends for about 4-5 months of the year, we tend to move rather slowly. In November 2012 I published a post titled You Really Can’t Make This Stuff Up about a castle in south-western Germany called Festung Hohentwiel, a virtually impregnable fortress built over a thousand years ago on the magma core of an extinct volcano. Last Saturday, the party finally, finally made it to the front door. 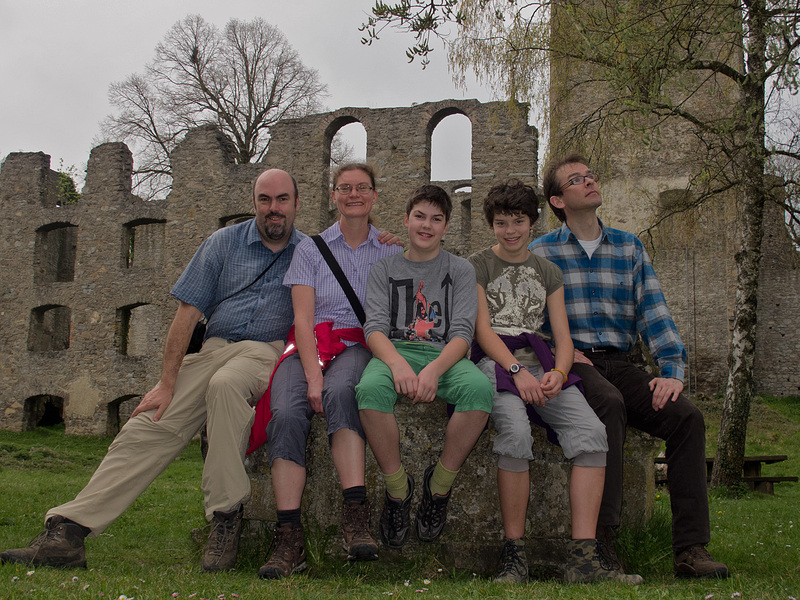 Instead of gaming this afternoon as we’d planned, the five of us jumped in our car and drove 2½ hours down the road to explore the ruins. Unfortunately the weather wasn’t the best for taking photos, but we had a blast nevertheless. Looking at a map on a tabletop is one thing. Being able to visit a location like this was brilliant and inspiring for all of us. When we first switched from Dragon Warriors to Savage Worlds three years ago, the kids were quite a bit younger (9 years old). I think we played with the Savage Worlds Adventure Deck once and it wasn’t a great success. We were all still getting to know the new rules and the deck was more of a distraction than a game aid. Yesterday Hermann brought his pack along, and it worked brilliantly. The party is presently in a rainy fortified northern town where they’re trying to find the location of a powerful artefact – the spirit of an angel trapped in an orb. They came to a strange city with no contacts, little context and a lot freer game setup than they were used to: no spoon-feeding information or tips – they had to do all the legwork themselves. Find a tavern for gossip, check out the town square, put their ears to the ground, establish some contactsand work out their strategy. The previous session had seen them exploring the streets, looking for an angle and information. Yesterday’s time was spent forming a plan and implementing it. They’d already established that the geriatric head of the town temple was being poisoned – probably by his prior – and decided to poke their fingers in this particular wasps’ nest to see what reaction they could provoke. Whilst they were ensuring that the Heirophant was getting the medical care he needed, the prior headed into town to raise a rabble of local zealots to drive them out of town. Returning to the temple, the prior demanded that the zealots throw the party out as interfering foreigners who were making the Heirophant sick. Sir Elathan (my 12-year old son’s knight PC) threw the ‘Peace‘ card into the fray, giving them a chance to turn the tables. Using Gnome Stew’s High or Low game dynamic (which went down very well and we will definitely be making regular use of) we determined that the Heirophant had rallied enough in his sick bed to address the rabble. Not only did the Prior end up being unceremoniously booted out of the temple, the party now has a willing bunch of stooges who are prepared to follow them to hell and back. They then managed to bleed a load of information from one of the castellan’s ‘eyes on the street’ using the ‘Spill the Beans‘ card, making me give away a spoiler that I was hoping to spring on them later, namely that the rumour that the gargoyles bedecking the fortress came to life at night to watch the battlements really was just that – a rumour set in motion by the castellan to dissuade unwanted intrusions. A night-time ambush of a patrol of soldiers with the help of the zealots from the temple has now enabled them to get kitted out with a disguise to get into the fortress. I managed to start and end the session on groan-earning cliff-hangers. We’d left off last time with one of the dwarves just noticing that he was being followed down the street on leaving the temple. This time we left it that the knight had just donned his disguise before attempting to breach the fortress security. Part of the uniform is a ring with a spike that bites into the wearer’s finger (it’s part of some nasty blood magic being used by the castellan). He’d spent ages humming and hawing about whether or not he should wear the ring or just break the spike off. He’s just put the ring on with the spike piercing his finger and felt a foreign presence trying to contact his mind. Dun dun duuun! It’s been a while. We’ve played a couple of times in the meanwhile, but nothing really report-worthy. 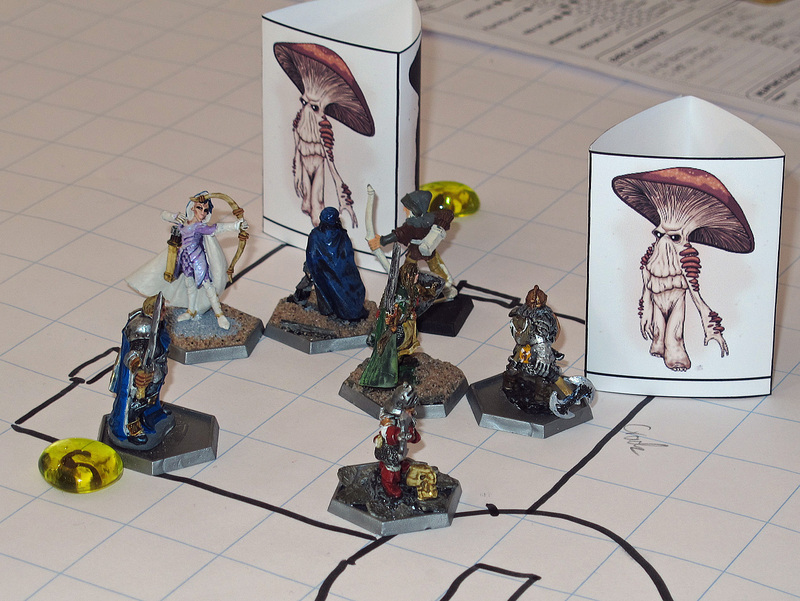 A virtual TPK with goblins in the Pagan Mountains, the pain on my players’ faces as they were forced to give a powerful artefact into the hands of their nemesis (Bwahahaaa). Got some nice involvement there. But a lot of hack and slash in the dwarven tunnels that had been overrun by goblins. Now they were rested up and healed (except one of the dwarves, who took a permanent wound to the guts, reducing his Agility) and free to use the dwarven tunnels allowing them to travel safely through the mountains to Glissom. There was some scene setting – basically it’s grey and wet – and then into a completely fresh set up for our group. Firstly I need to explain the constellation; our group is essentially my family (wife, two twelve-year olds) and a neighbour, all of whom have only ever gamed under my GMing and are relatively RP-naive. So far our style has been relatively classical – I’ve defined the quest and set the breadcrumb trail that leads them through it. Yesterday we handled differently; the goal is clear, they need to get their hands on a powerful artefact in order to defeat their nemesis and protect Albion from his power. They know that the artefact is (or at least was) in Glissom, but that’s all. I started by having them look over their character sheets, to remind themselves of their characters’ Hindrances etc. and then had them articulate their characters’ non-quest hopes and fears for their time in Glissom. Then they found themselves being turned away at the city gate: no armed riff-raff here! So they had to work out how to get into the city and then get the lie of the land. I had a few set pieces prepared, a shed load of NPCs, re-read the “Prince of Darkness” notes on Glissom, invented a few bits to fill in the gaps and drew a few maps of parts of the town, dockside, market square etc. and left them to it. Getting into the city was no problem once they’d left their gear on a farmstead with one of the party, but they’ve had to leave their precious arms and armour behind. The preparation paid off, they went to all the ‘right’ places, interacted with some of the NPCs, had some dramatic moments (witnessing a woman’s husband being carted off by the town militia) and some comic ones (Wee Mad Maggie accosting them each time they cross the market place and feeding them a wild mix of truth and rumours when they cross her palm with silver). They came up with some good ideas of how to go about finding out what was going on, used their skills well and have made some allies and a notable enemy. What they haven’t done yet is come up with a concrete plan on how to attain their objective, though chatting about this over dinner they did have some good ideas. My preparation paid off as it let me be a bit flexible without getting stressed, which is something which has happened in the past with game-affecting consequences. One of the best pieces of advice had to do with understanding my NPCs rather than necessarily planning every action in advance, looking at the “why” rather than the “what” (thanks UmbraLux). Another bit that stuck was Thasmodious’ “Say Yes”, encouraging the PCs’ solutions rather than blocking them just because I hadn’t thought of that particular solution. There might be some consequences for this in terms of what happens next, but I think we can run with it. I think what I particularly enjoyed was their picking up of clues and coming to the right conclusions, albeit not immediately – I’ve been able to communicate the overall situation by suggestion rather than reveal. The flashes of revelation and understanding have been fun to watch. Biggest challenge so far has been keeping my son engaged. His knight didn’t see any action as it was the non-combat Skills that came to the fore, though I suspect that this might change in two weeks’ time when we carry on. Apart from the Dragon Warriors source materials on Glissom, I found two resources to be very useful in preparing the city and its inhabitants; firstly Zac S.’s excellent “Vornheim: The Complete City Kit” and secondly Johnn Four’s free “NPC Essentials“. Also a discussion on transitioning from railroad to sandbox on the Savage Worlds boards helped me to get my head round a couple of points, particularly in terms of NPC motivations. Despite my advancing years (vintage ’68), I still enjoy a good computer game. 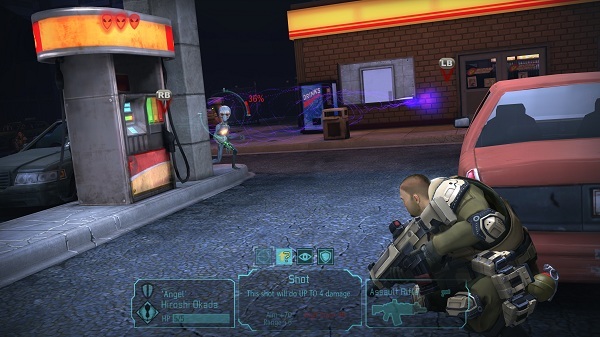 A couple of games that I’ve enjoyed more than I thought I would were the Firaxis titles “Sid Meier’s Pirates” and more recently their re-working of “XCOM: Enemy Unknown”. What both games have in common is the way they break encounters down to their essential elements. They’re the opposite of wildly rambling megaliths such as Skyrim (which I also hugely enjoyed), but they still work exceptionally well. 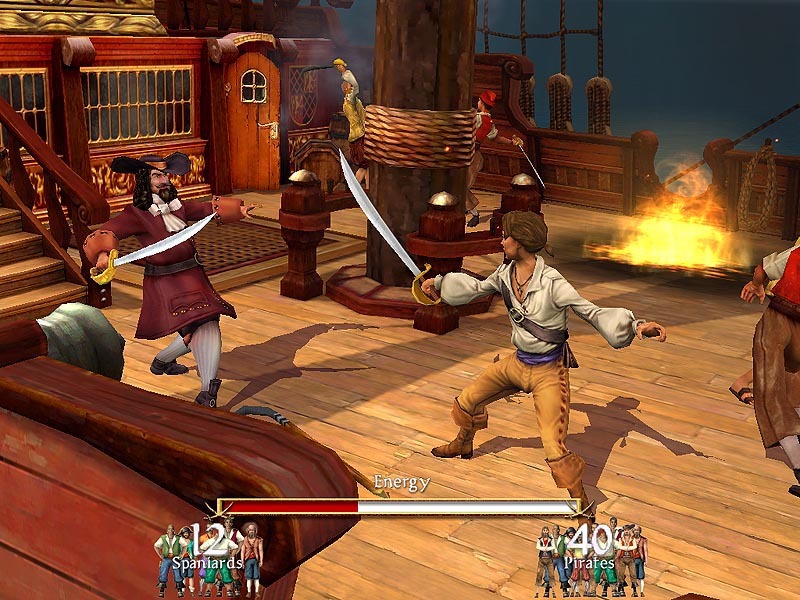 In ‘Pirates for example, the action is distilled into a variety of set pieces; sea battles, on-board duels, pub brawls, dances (!) and sneaking through towns. Oh yes, there were treasure hunts too. So how does this relate to GMing? Do we create massive sandboxes with details in every corner, whole worlds?, or do we create cut-scenes? Savage Worlds lends itself very well to the cut-scene approach. Both the avowed ‘pulp’ feel of the game, together with the famous ‘Fast, Furious, Fun’ aim seem to lend themselves to this approach. In my next session, for example, the players will have to rescue a captured dwarven prince from goblins who are holding him hostage. A number of set pieces immediately come to mind: stealth manoeuvres to take out sentries, chases to run down messengers who would sound the alarm, mini-battles and the like. Of course there is also room for combinations of these elements and more. The trick will be to avoid railroading the party, or at least to maintain the illusion of choice (isn’t that what we do most of the time if we’re honest?). Freedom to decide is often actually the freedom to make an arbitrary choice: “Do we go left, right or straight-on at the crossroads? ” Without any information to guide the choices, the result is pretty random. In fact, we can even offer a false choice, one where the outcome is the same whichever track they take. But that would be pretty pointless.